Public education and awareness should be the cornerstone of any successful mosquito abatement program. FCMC has and will continue to keep the public informed about the process and progress regarding our operation. This webpage, local print media and press releases are our primary means of keeping the public informed. 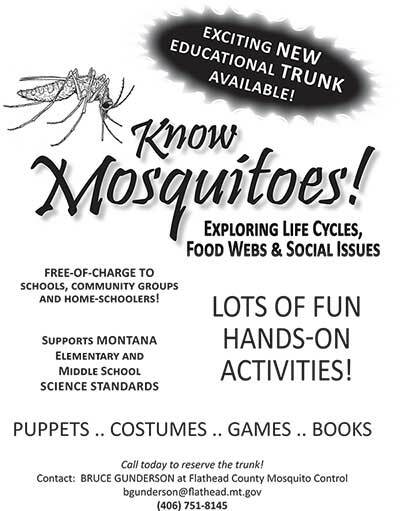 Presentations with regard to Mosquito Control in Flathead County are available to school classes K-12 and to civic organizations by request. Email Bruce Gunderson at bgunderson@flathead.mt.gov to schedule. Are you raising your own mosquitoes? The FCMC is asking for your participation in reducing mosquito populations in your neighborhood. There are many cases in which homeowners are inadvertently breeding their own mosquitoes! It takes very little water to produce hundreds even thousands of mosquitoes. Tires: Unused tires without rims provide a perfect habitat for mosquito production, especially if you add a little bit of organic material such as leaves. Store all tires indoors or laying flat with a cover suitable to prevent them from collecting water. Rain Gutters: Gutters can become clogged with debris, sag over time and collect enough water to become a source of mosquitoes. Flush gutters to clean debris and raise sags to maintain steady flow during a rain event. Swimming Pools: Properly maintained pools (cleaned regularly, chlorinated and covered) generally pose no problems. Unused pools, especially small wading pools, can quickly become skeeter breeders. Maintain pools and discard old unused pools. Boat covers and tarps: Sagging boat covers or other tarped items tend to collect leaves and other material that will produce mosquitoes. Tighten tarps to prevent sags. Flower pots and bird baths: Dump old water and clean once a week. Agitated water or operating fountains generally do not breed mosquitoes. Buckets, cans, wheel barrows: Anything that can collect water and debris can become a potential mosquito breeding habitat. Dump water and debris from containers. Store any item that can collect water upside down. Wear loose fitting long sleeved shirts and long pants, socks and hats when outdoors from dusk to dawn or during mid day if in wooded or brushy areas or tall grass. Insect repellents can be applied to the clothes including the hat. Insect repellents containing DEET should be applied sparingly and only to exposed skin. Concentrations greater than 35% may be toxic. Concentrations vary from 10% to 100% so read the labels. Do not put on wounds or areas with broken skin. Pregnant women should avoid exposure to DEET if possible. Do not breathe it in or get it in the eyes. Do not apply repellents with DEET to the hands of children who may rub it into their eyes. Rather than applying repellents containing DEET directly on children, apply to your own hands and then put it on the child. Spray children’s clothes with repellents before putting them on to avoid inhalation. DEET is usually effective for approximately 4 hours. Wash all treated skin and clothing with soap and water after returning indoors. Mosquito coils, candles, etc. may be helpful but keep out of reach of young children. There are many natural repellents on the market which may or may not be effective. Keep grass or weeds cut short. Soothing anti-itch lotions, creams, or sprays available over the counter. Ask your pharmacist or health care provider for recommendations. Over the counter oral antihistamine medications. Consult your pharmacist or health care provider for recommendations. Do not use both topical and oral Benadryl at the same time as some of the topical Benadryl may be absorbed into the body resulting in an overdose. For further information contact the Health Department at 751-8110 or your personal physician or health care provider.